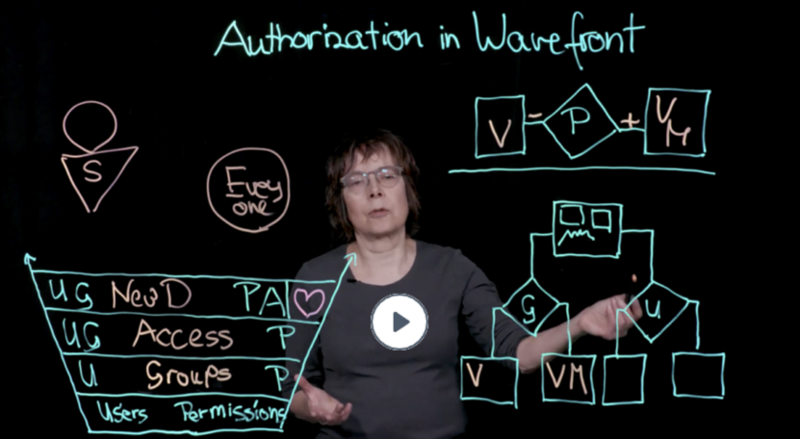 Learn about authorization of Wavefront groups and users. Wavefront supports several levels of authorization to support customers with different authorization needs. The basic level is based on permissions assigned to individual users. If you’re an administrator who wants more control over who can do what, you can perform some additional setup tasks. Note: If you need more than global permissions for users, you can give permissions to groups. For example, you could give the Engineering group Dashboard permission to allow them to manage all dashboards. If that’s not enough, you can add access control, which revokes or grants access for individual dashboards and alerts. Watch this video for an overview of the different authorization features. Permissions for users – You can initially use the model in which each user has access based on permissions. Permissions are global. For example, if you have Dashboard permission, you can manage all dashboards. Permissions for groups – Using permissions with groups is faster and less error prone than using permissions with users. It’s easy keep permissions consistent. Access control on objects – While permissions are global and apply, for example, to all dashboards, access control allows you to restrict who can view or view and modify individual objects (initially dashboards and alerts). Security preference for new objects – In high security environments, administrator can set a security preference so that all new dashboards and new alerts are accessible only to the creator and to Super Admin users. Level 1 authorization allows adminstrators to assign permissions to individual users. Level 1 means minimal effort, but also minimal control. Can perform a set of New User Actions such as viewing dashboards, alerts, etc. Has a set of New User Permissions. This set is determined by the administrator. All users get the permissions that the administrator assigned to the Everyone group. For example, all users might get Dashboard permission and Proxy permission. Users with Users & Groups permissions can grant or revoke permissions for individual users (and for groups, discussed next). Starting with Release 2018.46.x, administrators can use groups to make permissions assignment faster and more transparent and consistent. Assign permissions to a group. For example, assign Dashboard permission to allow each group member to manage all dashboards. In conjunction with access control (see Level 3 below), grant or revoke access to individual dashboards or alerts to a group. You create one or more groups and assign permissions. For example, you can create an Admin group that includes Users & Groups permission. When you invite a new user, you can add the user to one or more groups. The UI makes it easy to see where a permission comes from. You can manage permissions on a per-group basis. For example, assume that the Marketing group has Users and Groups permission. If you remove the permission from the group, all members of the Marketing group no longer have it. You can still manage individual permissions. For the example above, after you’ve removed Users & Groups permission from the Marketing group, you can give the permission explicitly to a few members of the group. A user who belongs to more than one group gets permissions from both groups (addition). Wavefront does not currently integrate with the groups of your identity manager (Active Directory or LDAP). Starting with Release 2018.46.x, Wavefront supports object-level access control in addition to global permissions. Initially, we support access control for dashboards and for alerts. All users with Dashboard permission can view and modify all dashboards. Those users can also change access to individual dashboards from the Dashboard browser. In high-security environments, an administrator can change the default Security preference to grant access for new objects (dashboards and alerts) only to the object creator. After the preference change, only the object creator and Super Admin users can access new objects initially. Those users can share the dashboard with user groups or individual users. Users with View & Modify access can then share the dashboard with more users. Initially, all users in the Everyone group–that is, all users–have View & Modify access to all objects. Modify access is granted only to the creator of new objects (dashboards and alerts), to Super Admin. Those users can grant View or View & Modify access to the object. Other users initially cannot view and cannot modify any new dashboard or alert. Users in the Everyone group continue to have View & Modify access to objects that existed before the switch – and all users in the Everyone group can remove the Everyone group from the dashboard’s access list and add other users or groups. If the administrator changes the Security system preference back so that Everyone has access to new dashboards, then objects that were created while the setting was Creator only continue to be protected by access control. Note: This security setting affects new objects only. If you change the Security preference to give modify access only to the dashboard creator (strict access), then you affect any new dashboards for the customer or tenant (team). If you change the Security preference to Everyone, then all dashboards that were created during strict access remain protected by the access control list. Example: Can Dana View or Modify Dashboard X? In this example, we’ll consider whether a user (Dana) can view or modify a dashboard. We start with the simple case where the Security system preference that determines access to new dashboards is set to Everyone (the default). In that case, permissions determine what Dana can do. Dana can view dashboard X because, unless access control is set, all Wavefront users can view all dashboards. If Dana has Dashboard permission, Dana can modify all dashboards. Otherwise, Dana cannot modify any dashboards. Now let’s assume the administrator changes the setting for access to new dashboards to Creator. In that case, permissions still apply but whether Dana can view or modify a new dashboard depends on access. If the group has View & Modify access, Dana can view and modify the dashboard. If the group has View access, Dana can only view the dashboard. Finally, Wavefront checks if Dana has individual (user-level) access to the dashboard. If Dana has View & Modify access, Dana can view and modify the dashboard. This is true even if Dana belongs to a group with only View access. If Dana has View access, Dana can View the dashboard. If Dana also belongs to a group with View & Modify access, Dana can also modify the dashboard because access is cumulative.